For the second year, LaPorte is proud to have been one of only four Gold Sponsors of the Houston Business Journal‘s Fast 100. 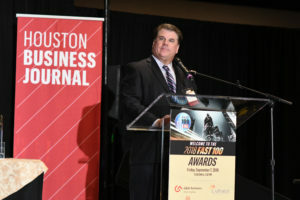 The 2018 Awards Luncheon was held on September 7 at the Hilton Americas Houston Hotel. During the event, the top 100 finalists learned their rankings based on their past two years’ growth. All of the companies honored are headquartered within the 10-county Houston metropolitan area and have been doing business for a minimum of five years. Audit and Assurance Director Doug Hidalgo spoke on behalf of LaPorte at the luncheon, recognizing the initiative, creativity, and commitment of the Fast 100 companies. Over 400 people attended the luncheon to celebrate these finalists and their leaders. LaPorte is committed to supporting business communities across Texas and Louisiana. The sponsorship of the Fast 100 is just one example. Our firm is ranked the 132nd largest CPA firm in the country according to INSIDE Public Accounting. We have five offices across the region, including our Houston office.